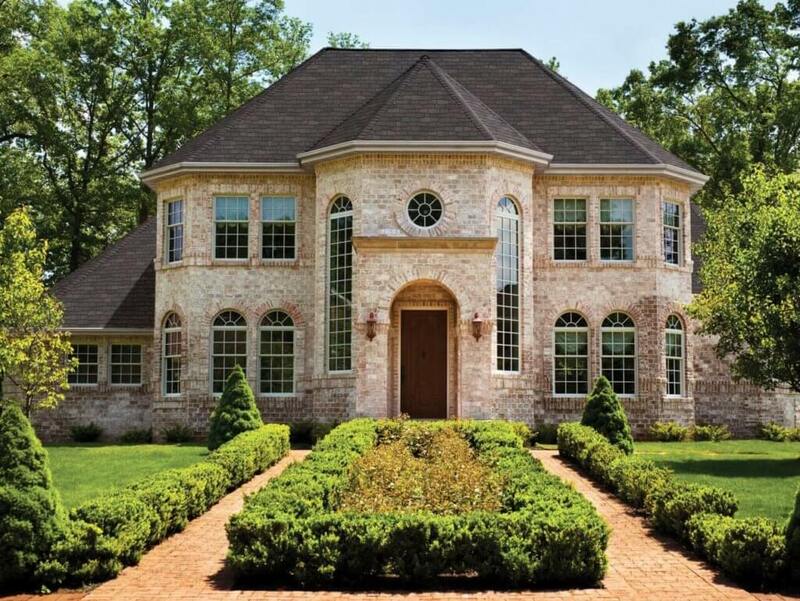 If you want to have a timeless house exterior that will always impress, brick is the best choice. The cost of good quality brick siding ranges from $12,000 to 22,000, installed on a 2,000 sq.ft. house. Whether you plan to clad your entire house with brick, or combine it with other materials, brick will maintain its value over time. While initially expensive, brick is a highly durable, low maintenance and long-lasting siding that will look stunning for decades. In fact, it can easily last well over 100 years! If you will ever want to sell your home, prospective buyers will be willing to pay top dollar because your house is brick. Prices for siding bricks will vary greatly based on material quality, type of brick, color, manufacturing process, etc. On average, face brick costs $6 – 10.50 per square foot installed. Your budget for 1,000 bricks can run as little as $340 to as much as $850. Most people report spending $500-600 for 1,000 solid bricks. For wall installation, you will need about 7 bricks per square foot. One pallet of bricks contains about 510 pieces. Extruded brick, that is made through a mold, is the least expensive and most common product. Sand molded and hand made bricks are significantly more costly. Also, the color of the brick will impact its price. The final color depends on how it was fired. Those that are fired mechanically in commercial kilns will be the cheapest, but will also have very limited and bland color options. On the other hand, bricks that are fired in beehive kilns by hand (old school), produce some of the richest and unique colors. Thus, they are a lot more expensive. Different textures may also affect pricing, depending on the method it takes to achieve a specific look. Pro Tip: it is usually a challenge to match a particular brick color if you need to replace broken or damaged pieces. We recommend ordering more bricks prior to installation, so you have enough materials of the right color, in case you will needs some extras. These extras will also come in handy at a later time, years after the initial install, when you will want to replace broken pieces. Building (structural) brick that is used in construction and has holes to save material and reduce weight, costs $0.55-0.75 cents each. Thin brick, also known as brick veneer is the most expensive option. Prices average $7-8.5 per square foot. Its about 0.5 inches thick, and comes in a much wider range of colors than classic full brick. Many homeowners prefer to use brick veneer as as an accent combined with fiber cement or vinyl siding. Because brick is a specialty material, it will cost more to install, compared to most other types of siding. Experienced contractors charge $25-35/hr to brick a house. Cladding 1,000 sq.ft. of exterior wall with brick can take about 100 hours, depending on the complexity of the architecture and the experience of the installer. Thus, you would be looking to pay $2,500-3,500 in labor charges for every 1,000 sq.ft. of brick siding. It is very important to hire a contractor who specializes in masonry work and has many years of experience. This siding material is too expensive of an investment to allow a poor quality, cheap installation to compromise its durability and integrity. To find the right pro and a good price, get free estimates from your local brick installers. You should also keep in mind that solid brick CAN NOT be installed over another siding. Thus, you will first need to remove the old siding. This will add another $1,000-3,000 to the total cost, depending on the size of the house and weight of the old siding. Removing old solid or brick veneer siding is even more costly, $4-6 per square foot (this includes underlayment and drywall). If you are planning to install brick veneer over existing material, its best to check with your contractor if your house structure can handle the extra weight load. While veneer its much lighter than solid brick, it can still add a significant weight to the walls. In some homes, this can lead to serious structural damage or even collapse, unless appropriate reinforcements are added ahead of time. Moreover, if you have a two-storie house, your contractor may need to build additional supports to handle the weight load of the solid bricks on the second floor. This will further increase your project cost. Pro Tip: in case you need to store brick for sometime before installation, make sure to put it in a dry, moisture free place. You should be especially careful to avoid putting it directly on the ground. Doing this can cause staining, as well as moisture infiltration that will compromise brick’s durability. There are a number of stores that have different types of brick readily available. The biggest and most accessible across the US are Lowe’s and Home Depot. Dedicated building materials suppliers will have a wider selection of products available, but they will also be more expensive. Moreover, its possible to get recycled red brick from old houses, on Ebay, and specialty websites that sell reclaimed building supplies in good condition. If you are looking for the lowest prices on red brick, Lowe’s and Home Depot offer the best deals. Lowe’s really doesn’t have much of a selection. They sell Oldcastle Clay Brick for $0.72 each. Its got 80% positive reviews, and people who bought it report that it’s light weight, has a beautiful red color, easy to work with, and holds mortar well. One thing to be aware of is that the size of the hollow core in this brick is very large. Therefore, you need to be careful with mortar, otherwise you will be wasting a lot of it as it falls through the holes. Old Mill Colonial Collection thin brick (natural clay). There are a number of color options available from red to weathered grey. It can be used to clad exterior or interior walls – $56.59 – 60.18 per box. Each box contains 50 brick flats and covers 7.3 sq.ft. Old Mill Colonial Collection thin brick corners – wide range of colors, can be used for interior and exterior applications – $52.79 – 76.12 per box. Each box contains 25 corner pieces. Old Mill thin brick corners fastened to fiberglass sheeting. Various colors and easy DIY application – $67.64- 74.86 per box. Covers 5.3 ln.ft. Old Mill Brickweb Castle Gate thin brick fastened to fiberglass sheeting. Nice red color, fast DIY application – $81.43 per box. Each box contains 5 sheets and covers 8.7 sq.ft. This is one of the highest rated and most popular of all Home Depot brick products. How much does it cost to brick one wall? Homeowners that can’t afford to brick their entire house will often use it only on the front facing wall, and a less expensive siding on less visible parts of the house. The average price of bricking one wall of 1,000 sq.ft. with solid brick is about $4,500-6,000 (includes all materials and labor). Brick veneer for the same size wall would cost $8,000-10,500. While having only one brick wall eliminates the thermal benefits, weather protection and energy savings, it still adds major curb appeal to your house. This can be a huge bonus if you are planning to sell your home in the near future. Prospective homeowners place a lot of emphasis on the exterior appearance, so your house will be in a winning position. When you compare the cost of various siding materials, its clear that brick is on the more expensive side. In fact, its one of the most expensive house sidings, rivaled only by stucco and stone. Compared to the cheapest siding, such as vinyl, and aluminum installing brick can cost 40-60% more. However, compared to higher end siding, such as fiber cement, brick costs the same or slightly more. Similarly, top materials such as natural wood, engineered wood, or stucco cost the same or more than brick. Lastly, stone siding is significantly more expensive, while offering largely similar benefits. Despite the high initial cost, cladding your house with brick has tremendous benefits, unmatched by other siding. Brick provides superior insulation properties, keeping your home warm in the winter and cool in the summer. Having this insulation will allow you to save at least 20-30% on your heating costs. This adds up to hundreds of dollars in the Northern states during the winter months. Properly installed brick siding will not require any maintenance, repairs, or repainting. Over the years, mortar that holds the bricks together will actually get stronger. All you need to do is an occasional power wash to make the brick look fresh and clean. This too adds up to thousands of dollars in savings over time. By comparison, all other types of siding (except for stone) require maintenance, repairs and occasional painting or staining. If you cannot do this job yourself, hiring a contractor every few years becomes an expensive addition to the initial cost of seemingly cheap siding. It goes without saying the brick is an extremely durable material, rivaled only by stone. Your brick house will be left unscathed by the most severe snow, wind and rain storms, as well as high temperature fluctuations. It is impervious to moisture, rot, decay, and insect infestation. Brick truly is a “forever” material. This is why you can can get reduced house insurance premiums on a brick home, as insurance companies love to see safe and durable building materials. Lastly, when it comes to curb appeal, aging will not ruin the original appearance of your brick siding. Homes that are over a century old are as grand and beautiful as new construction residencies that were build 3-5 years ago. In fact, most people prefer the look of aged, weathered brick, and many manufacturers produce new products that replicate this timeless look. Before spending thousands of dollars on a premium building material, savvy homeowners want to know whether they will get a good return on their investment. When it comes to brick, the answer is YES! On average, brick houses across the US are known to appreciate by a factor of 9.5% compared 3-5% rate of appreciation typical for vinyl siding homes. Its important to note that these estimates can vary greatly depending on your particular area. A brick home can also sell for 5-6% more than the price you have originally paid. More importantly, buyers simply love brick, so you will have a much easier time selling your home quickly and getting highly competitive offers.